Throughout history, many kingdoms and nations have closely aligned themselves with religion by establishing official, government-endorsed faiths. 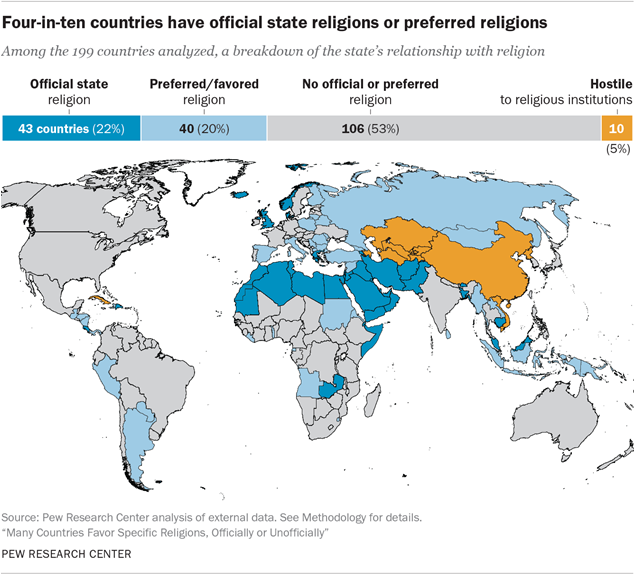 Today, more than 80 countries either have an official religion or favor one or more religious groups over others, according to a new Pew Research Center report. Countries that have an official religion, such as Iran or the United Kingdom, confer an official and legal status to one faith group, often granting that group benefits not available to other religions. Some nations do not officially endorse a faith, but instead favor or prefer a religion by granting financial, legal or other benefits to one (or occasionally more than one) religious group – as is the case with the Roman Catholic Church in Italy and Spain. Countries without an official or preferred religion, such as the United States and Brazil, may have explicitly secular constitutions or basic laws that guarantee religious freedom, although this alone does not qualify them for this category. In addition to these laws, governments in these countries seek to avoid giving tangible benefits to one religious group over others (although they may evenhandedly provide benefits to many religious groups). Other countries, meanwhile, are either officially or unofficially hostile to religion, often making it very difficult for any faith group to practice freely. 1Roughly one-in-five (22%) of the world’s nations have an official state religion and a similar share (20%) have a preferred or favored faith tradition. 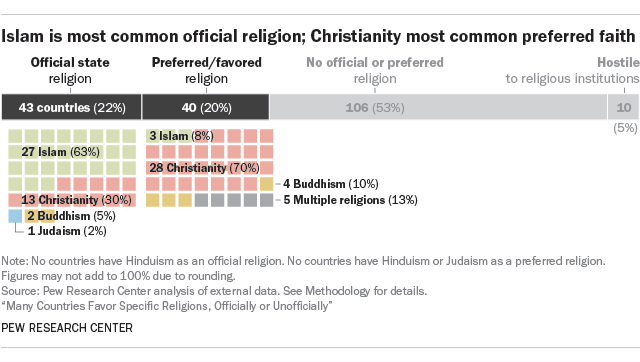 The majority (53%) of the 199 countries we examined, including the U.S., have no official or preferred religion. Another 5% of the world’s nations are officially hostile to or extremely restrictive of religious institutions. Although a number of formerly communist countries now have official or preferred religions, all of the 10 countries that are hostile to or extremely restrictive of religion are either ruled by communist governments, such as China and Cuba, or are former communist states, such as Kazakhstan. 2Islam is the official religion in nearly two-thirds of the countries (27 of 43) with an official state-endorsed faith. Most of the countries where Islam, or a sect of Islam, is the state religion are in the Middle East and North Africa region (59%), including Saudi Arabia and all of its neighbors. Most of the remaining countries where Islam is the official faith are in the Asia-Pacific region, including Pakistan, Bangladesh and Malaysia. In most of the remaining countries with a state religion, that religion is Christianity or a denomination of Christianity; these include Denmark, the Dominican Republic and Zambia. 3Christianity is favored in seven-in-ten countries where the government has an unofficial, but preferred religion. Most of these 28 countries are in Europe or the Americas; they include Italy, Poland and Russia, as well as Argentina and Guatemala. Four states, including Burma (Myanmar) and Sri Lanka, favor Buddhism, while three nations, including Turkey and Syria, favor Islam. Five additional countries, including Eritrea and Serbia, favor multiple faith traditions. In Eritrea, for instance, the state recognizes four religious groups: the Eritrean Orthodox Church, Sunni Islam, the Roman Catholic Church and the Evangelical Lutheran Church of Eritrea. All other religious groups are required to register with the government and must cease religious activities until those registrations are approved. The Eritrean government has not approved registration for any additional religious group since 2002. 4Religious groups that either are officially recognized or unofficially favored usually receive state funding or other resources for religious education, the building and upkeep of places of worship, and other activities. More than eight-in-ten countries (86%) with an official religion give religious education funding that disproportionately favors the official religion. And over half (51%) provide disproportionate funding or resources to the official faith for their religious property (such as a church or mosque). In countries with an unofficial but preferred religion, a third (33%) give disproportionate funding or resources for religious property, and 45% do so for other religious activities, including pilgrimages and salaries for clergy. 5Countries with an official or preferred religion are more likely than those without to have government restrictions on religion. Using a modified version of Pew Research Center’s Government Restrictions Index – a 10-point scale on which governments with the most religiously restrictive policies score a 10 – countries with a state religion have a median score 4.8. That compares with a score of 2.8 for countries with a preferred religion and 1.8 for those without an official or preferred faith group. This analysis excludes the 10 countries that are hostile to religious institutions.